Steve Evans is the hot favourite to become the next Posh manager. The hot favourite to become the next manager of Peterborough United has refused to comment on speculation linking him to the job. The Peterborough Telegraph contacted current Rotherham United manager Steve Evans this morning (September 9) after the odds on him replacing Dave Robertson plunged to 4/6 at Sky Bet. Evans was also warmly tipped in the summer to take over at the ABAX Stadium before Robertson was handed the chance to build on a steady effort as caretaker-manager towards the end of last season. Evans has made no secret of his desire to manage Posh at some time in his career. He is a Posh fan who lives in Wansford and who gets on well with Posh chairman Darragh MacAnthony and director of football Barry Fry. But Evans also enjoys an outstanding relationship with Rotherham chairman Tony Stewart. It’s unlikely he would resign or be sacked from his current post so Posh would have to negotiate his release from the New York Stadium. Rotherham are currently bottom of the Championship so if Posh are interested in Evans this could be the time to strike. Evans has an outstanding record in the lower leagues winning promotions with Rotherham and Crawley. He steered both Boston United and Crawley into the Football League. He managed back-to-back promotions with Rotherham and kept them in the Championship last season despite operating on one of the lowest budgets in the division. The Daily Mail are today reporting that Evans is the number one target of chairman Darragh MacAnthony. They say MacAnthony wants his new man in place in time to take charge of the League One fixture at Oldham on Saturday (September 12). 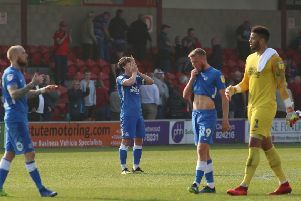 The Peterborough Telegraph understands that an appointment is unlikely to be made before the trip to Boundary Park. Grant McCann, Robertson’s assistant manager, will be in charge at Oldham. Another of the favourites in the Sky Bet list, Jimmy Floyd Hasselbaink, today ruled himself out of the running.